Given that we appear to be living through a particularly unpleasant blip in the ongoing saga of mankind, a new Alarm record seems like just the salve we need. Indeed the fact that this album exists at all is a testament to the endurance of the indomitable human spirit in the wake of tragedy and woe. 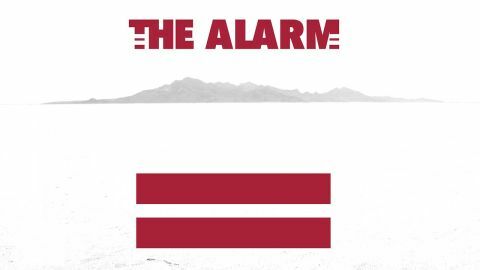 The first new Alarm album in eight years comes after frontman Mike Peters’s second battle with leukaemia and his wife and piano player Jules’s breast cancer diagnosis in 2015. Both are now in remission, and Equals reflects their struggles and cautious triumphs, turning their darkest days into the bright white light of chiming rock anthems. During the flurry of earnest 80s Celtic-flavoured alt.rock, The Alarm were often dismissed as a sort of junior-league Welsh U2. Lacking the punk-cult appeal of New Model Army or the hip, whiskey-soaked strumble of The Waterboys, they chose instead to write polished, radio-baiting, sky-scraping anthems like 68 Guns, Spirit Of 76 and The Stand. While these stoic protest songs made less sense in the tongue-in-cheek bummer-jam 90s, they have since become increasingly relevant as days grow darker. Peters remains the sole survivor of the original line-up, but since rebooting The Alarm in 1999 he has kept the band’s legacy alive and well, even while undergoing life-threatening health scares. The Alarm remain a living art form, and the music the band creates now bares less resemblance to their 80s counterparts than you might expect. Equals boasts a crackerjack band that includes former Joe Strummer drummer Steve ‘Smiley’ Barnard and Cult guitarist James Stevenson (The Cult’s Billy Duffy also makes an appearance, on the crackling Coming Backwards). The sounds they create combine Peters’s signature electric-acoustic strumming with a bubbling electronic vibe, a sort of old-school-meets-new-wave feel that’s organic enough to sound natural but most definitely brings the band kicking and screaming into the 21st century. The Alarm are still at their best, however, when Peters belts out heart-swelling anthems, and Equals is full of ’em, most notably the infectious Beautiful, a dazzling ode to joy, slinky opener Twin Rivers, and Crowd Control, a loud-quiet-loud rabble-rouser that sounds like a modern millennial pop hit only, you know, good. Fans of the band’s salad days will also gobble up vintage-sounding burners like 13 Dead Reindeer and Hellfire. Overall it’s a very tasty mix of past and future.